Hohoho.....Merry Christmas!!! 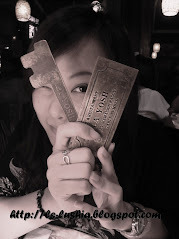 Had my dinner at Ho Ho Steamboat Restaurant today. Just a coincidence, we didn't pick this restaurant for dinner just because it's Ho Ho.....Anyway, it's a tiring day and because it is raining in the evening, all of the sudden I feel like having steamboat. While on our way back from shopping, we stopped by at Sri Petaling for steamboat as suggested by me. Steamboat sometimes also known as hotpot refer to varieties of raw ingredient and a simmering pot with broth in the middle of the table. Raw ingredients includes meat, seafood, vegetables, mushrooms ans etc and one can choose to cook their preferences in the simmering pot. Ho Ho Steamboat Restaurant serves only plain broth with mild taste, tasted just nice to dip in and cook the other raw ingredients served as ordered. The raw ingredients served are fresh which include prawns, fish slices, dumplings, tou fu, fried yam, fish balls and vegetables. The fish balls and dumpling are all freshly made and tranlsucent , dumpling meats are well marinated and tasted good. So, I was thinking about Yu Ai's Seafood Noodles yesterday and then I visited the Kuchai Branch for lunch the next day. Yu Ai serves seafood noodles in three types of soup base which is tom yam , curry and plain soup. The tom yam soup was light with distinctive hot, sweet and sour sensation. The varieties of mixed seafood used are fresh and plenty. If you are craving for seafood noodles, perhaps you my stopped over at the quite new branch of Segambut Yu Ai Seafood Noodles at Kuchai Lama. Yu Ai offers authentic soupy seafod fare that will simply satisfy you. Du Viet sometimes!! Well, Du Viet means "do vietnamese" for a meal. (sometimes) But, Du Viet is not the restaurant that we visited in fact we had our dinner at O'viet Vietnamese Cuisine, an outlet by the Du Viet Group. Three Colurs Delights, one of the house speciality turned out to be a pleasing dessert. A hearty combination of green grass jelly, cendol, red beans with low fat topping, a simple yet delightfully tasty dessert with subtle sweetness. My blur vision doesn't stop me from celebrating Don Zhi Festival. After 3 years of mourning period on my dearest grandpa's departure, we will be celebrating Dong Zhi Festival this year. But, am not back to home town to celebrate and just the same as last few years, I made my own and invited my friends from outstation and not travelling back home. This year is abit different, it's delivery rather then them coming over as everyone is having a tight schedule. Dong Zhi literally means the arrival of winter. Dong Zhi Festival also known as Winter Solstice Festival is an important festival where the Chinese family gathered to celebrate the good year they had and welcoming the new year. Dong ZHi normally falls on either 21st or 22nd of December as it is the day when sunshine is at its weakest point with shortest daylight. During Dong Zhi Festival, the Chinese will make Tang Yuan 湯圓 (Chinese) or Tong Yuen (Cantonese) and eat together among the family members. Tang yuan is made of glutinous rice flour and round in shape and served with sweet soup. Tang means soup in Chinese and Yuan means round, signifying completeness (yuan man) and the word "tang yuan" literally means "tuan yuan" which means family unity & properity. Hence, it's an important festival to celebrate among the Chinese. However, in another occassion Tang Yuan is eaten during the Lantern Festival, another festival for family reunion but it's seldom practise in Malaysia. The pink (red) and white mix signifies good luck. However some said, it is made to pink and white as it signifies yin ang yang. Nowadays they even have it in green colours( I don't what does that means...probably it's the modern day version). The bigger ones are tang yuan with filling. Mine is with red bean paste and chopped peanuts with sugar and the smaller ones are the plain tang yuan. Soup base- Garlic, dried shrimps, mushroom and preserved vegetable (tong choy) and add in minced chicken/pork balls. I chosed chicken as my best pal doesn't like pork. Am busy running from shops and mall to mall to search for a bath tub for my baby. Okay...not my baby, it's Jessie baby.....~lol~ I noticed that, it is always this way.....when I want to buy something eagerly, it's always hard to find and when I don't need it anymore....you can find it easily! It's almost 10 pm by the time I finished looking around in Istean and Robinson, The Gardens, so we looked for a place to dine. It seems like only Canton-I is still crowded and they still welcome us to dine in. 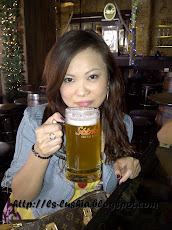 I think Sam did mentioned that this the worst glass of yin yong comparing to other char chan tengs. The best food served in this dinner. Freshly made and the waiting time is about 10-15 minutes. Served hot, the eggs were steamed to soft with slight orangy taste. Quite a satisfying dessert! Am not sure how new is the Canton-i in The Gardens but am sure they have improve much more on their food. Finally, Sam asked me a question like he always do, "will you come again??"..... I looked around and then flipped through their menu once again.... "Yes... probably to try their dim sum!" Canton-i is under the same management of Dragon-i Restaurant, a restaurant that serves Shanghainese cuisine which and has 9 outlets currently. As for me, foods served by Dragon-i are much better. Hope they won't disappoint me during my next visit! Who hasn't spend a relaxing Sunday morning at their favorite Chinese restaurant sipping tea and feasting on numerous delicacies of Chinese Dim Sum? SO, my aunt's family is here and I brought them to Restaurant Teo Chew House of Tim Sum for breakfast....Why did I choose here? Well, it's because of the location actually... and this is my first visit too. Originally, dim sum begins with the custom of yum cha (drink tea) by the Cantonese. In the olden days, travelers of the ancient Silk Road will stop by rest houses for nap and tea. Hence tea houses were built along the road and most tea houses serves light dishes which is currently known as dim sum. Therefore dim sum is the name of the Chinese cuisine where numerous number of light dishes is served alongside with Chinese tea. However, dim sum served in the modern days are no longer light as described, due to the development of the culinary of art of dim sum. Restaurant Teo Chew serves varieties of dim sum and you probably might feel like trying everything. 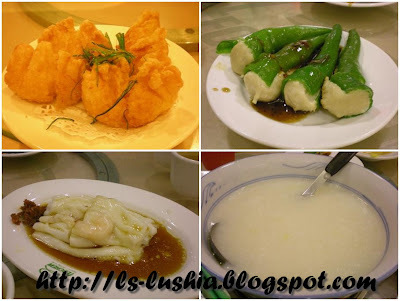 Dishes varied from steamed to deep fried dim sum, rice rolls, porridge,baos and even soup. Name it, and they have it! Char siu bao, shrimp dumplings with translucent skin, wu kok, mini spring rolls, siu mai, sui gow, chicken feet and lots more. Finally, the desserts like pudding and tarts. And after enjoying numerous types of dishes.........it's time to yum cha! Walked in any of house of dim sum, and you will probably need to browse through the menu to place an order. In Restaurant Teo Chew, the dim sums are served using the traditional style which is the cart system. The waiters and waitresses push around the carts and stop by at your table. Pick your choice and they will them steam the dim sum for you (only the steamed types) where food is served in steamer baskets. Well, I will be back to try more of it's dim sum next round! I wonder why......most of my friends doesn't fancy Korean food but not me. 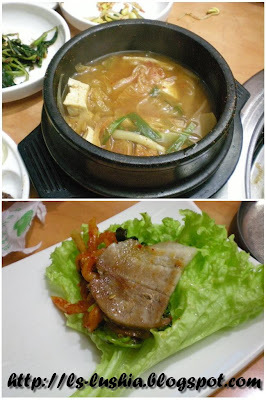 This time I visited Little Korea @ Ampang. In most countries, there is a Korea town and as for Malaysia, our Korea town is located at Ampang, an area long known for many Korean businesses, restaurants and stores operated by Korean residing in Malaysia. Not forgetting my favorite Kim Chi Zzigye, bean paste soup with Kim chi, tou fu and meat. We ordered portion of marinated and non-marinated porks to BBQ. Korean barbeque also known as gogi gui, refers to Korean method of griling meats like beef, pork,chicken. The meats are grilled at the diner's table using charcoal grills which is built in the middle of the table. At home, probably portable stoves are used. 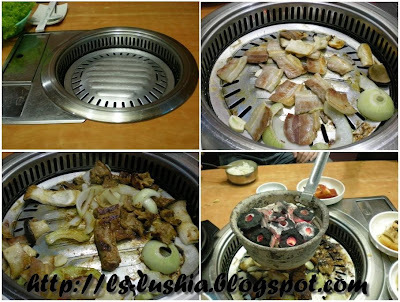 The most popular form of Koran barbecue is galbi which is marinated beef. 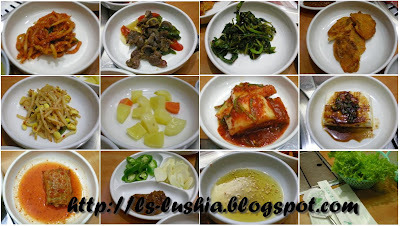 However, Korean barbeque includes many other kinds of meat. After grilling, pieces of meat can be wrap with the vegetbles provided and add on some side dishes to eat along. It's hot and cold......pleasantly inviting for another bite. Free dessert served after meal. Sort of ABC alike, but it's served with fresh milk. A desirable dessert. Everything sell by the store are imported from Korea even cereals and drinks where we have it locally are in Korean packaging. So... this is our last stop and we will be heading back to KL then. Hong Tho Restaurant is a restaurant which is famous with their various fried noodles and fish paste. A restaurant which is also featured in our local TV program The main reason I wanted to visit this restaurant is for their fish paste. 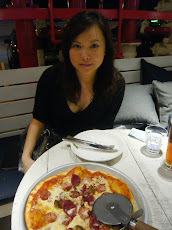 I used to be so fond of it and even until my last visit, it is still as good as before! Am not sure if I had tried this before........got to ask my friends. This is the signature noodle dish of Hong Tho restaurant. The noodles are served with small portion of seafood and topped with crunched ikan bilis. You may add vinegar if it is to you liking. As for me, this noodle dish is just so-so...nothing to shout about. As far as I am aware of, this restaurant used to be famous with their fried noodles, fish paste and homemade pastries and cookies. No... I don't like peanuts! I don't know why........About two years back, I had my first bowl of peanut puree/ creamy peanut dessert at Hong Kee Mah Chee, and this time, I had my second bowl of peanut puree at the same place. It's sort of difficult to locate this place but we managed to find it after making few wrong turns. Hong Kee has been operating for more than 20 years and it's a popular stall which is famous with their creamy peanut dessert and mua chi (glutinous rice coated we ground peanuts). Despite their no so easy find location, this stall is a favourite stall of tourists and locals. It is also a stall which is featured in our local newspaper and TV program as well. The peanut dessert (fa shang wu in cantonese) is extremely creamy, soft and smooth. Not too sweet and although it's creamy but it's not too thick and heavy. Took away for my best pal too. She likes this dessert alot!! As to mua chi( glutinous rice coat with ground peanuts and sugar), the glutinous rice is fresh and springy coated with cruncy ground peanuts. But, the portion served is too small. Hong Kee Mah Chee is a highly recomended place for peanut and mua chi lovers!! After having a bowl of tau fu far we decided to walked around the area to shop for dome fragrant biscuits known as heong pheah (香餅). It's a flaky biscuits with sweet maltose paste fillings. A popular snack of Ipoh, very often bought by tourists, Among the locals, best heong pheah is produced at a suburb area known as Gunung Rapat. While strolling down the street we notice there are so many shops selling Heong Pheah with different brands. Honestly, I have no idea which is the best beand but I remember my best pal bought a packet for me which is very nice especially the maltose filling with sesame which is superb. Somehow we spotted some Singaporeans buying about 30 packets oh Heong Pheah from this van infront of Ong Kee, so we stopped by and have a looked. The vendor let us try one of it and it tasted alright. And that's how we ended up buying Heong Pheh from Chang Weng- Gunung Rapat. 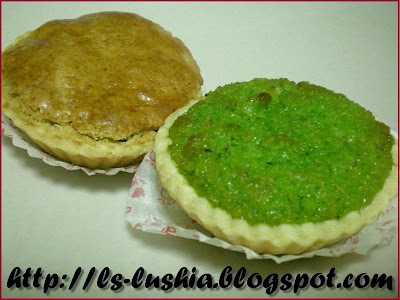 The flaky skin biscuits is aromatic, enveloping gooey sweet maltose filling. Soy bean curd also know as tau fu far in Cantonese or tau hu huay in Hokkien is a popular light snack in Malaysia and Singapore. It is an extra soft form of tofu (bean curd) made from soy milk. Almost each country in Asia has it owns style of eating soy bean curd. 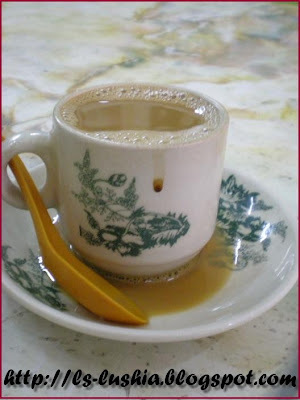 But in Malaysia and Singapore, soy bean curd is served with clear sweet syrup or soy bean milk or sweet ginger water. You see, it's almost finish and we were lucky as we were served first or else we got to wait for another 45 minutes for the next wooden bucket of soy bean curd to arrive. My bowl of freshly made,soft and silky tau fu far served hot with sugar syrup. We bought a small bottle of soy bean drink and I added some into my bowl of soy bean curd as it is too hot. It's still as delicious as it is...the soy bean curds were soft and fine in texture. It's so popular and that it is better to call to order before you drop in... but I didn't. Since we are planning to have the famous tau fu far around the area, we drop in Aun Kheng Lim to order the salted chicken and we were told to come back after 45 minutes to collect the salted chicken. Then, we walked across the road to the famous tau fu far stall. Salted chicken is a traditional chicken dish served to mothers during their confinement period as this dish which is prepared with dong guai, a type of herbs that contains properties that help to restore women's hormonal balance after pregnancy. Only small medium size chicken were used to prepare this dish! Chickens rubbed with salt and inserted with little silvers of dong guai between the maets are neatly wrapped with baking papers and then buried under whitish grey rock salt from China. Chickens were then baked for about an hour. After baking for about an hour, the dish is ready! The salted chicken is fragantly baked to light golden brown . Open up the baking paper wrappings and you will find the salted chicken is dripping with juices. with slight aroma from the herbs. The salted chicken tasted sharp and flavourful as the the herbs (dong guai) perfectly emitted to the chicken meat and the meat itself is tender. 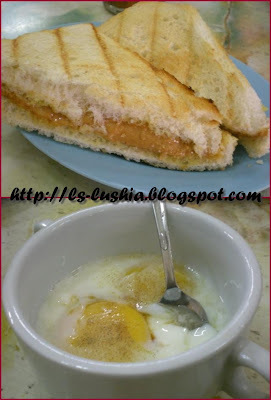 This is a specialty from Ipoh town that you should not skip! It's definitely worth waiting! The next day, we chose to have our breakfast at Old town instead of Dim Sum @ Foh San. needed a cup of smooth coffee to start the day! 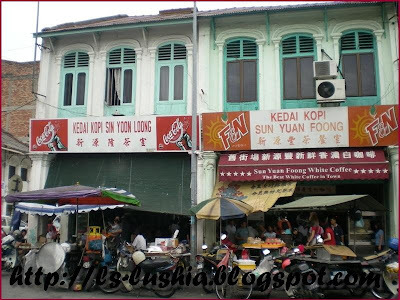 So, we went to Kedai Kopi Sun Yuan Foong for breakfast! A cup of smooth white coffee that brightens up my day. No doubt, we can have coffee and any Kedai Kopi, Starbucks, Coffee Bean or the Old Town White coffee franchises, but the feeling is definitely different! It's because, I am in the Old Town enjoying my cup of coffee! The bread were soft and slightly toasted then spread with peanut butter. Goes well with my cup of hot white coffee! Half boiled eggs??? Just feeling gulping down some half boiled eggs. Nothing special about it! Unlike what we have in other states, in Ipoh, chee cheong fan is served with sweet and sort of sour sauce, chili sauce then topped with preserved green chillies and deep fried shallots. The sauce tasted a bit weird to me.... but somehow I see many people enjoying their plate of chee cheong fan. Chee Cheong Fun is a cantonese dish known as rice noodle rolls. It is made by rolling up a thin sheet of sa hor fun ( flat rice noodles).